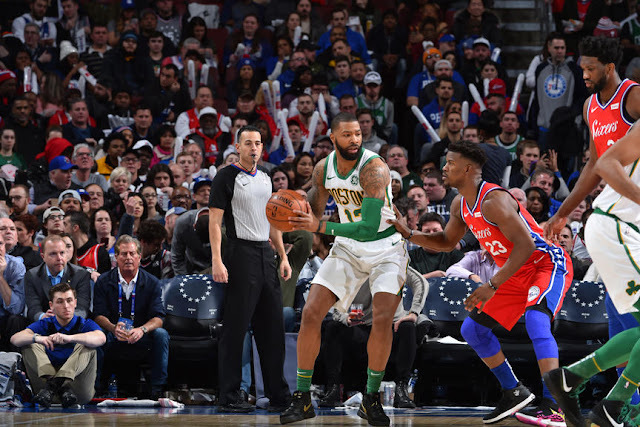 Opposing View: Philly's take on last night's loss to Celtics - "Sixers are not there yet"
This is the second installment of my new series, Opposing View. It is always interesting to see what the rivals, or at least the press that covers them, have to say about a Celtics win over their team. Philly.com's David Murphy feels that the 76'ers main issue facing the Celtics is a lack of depth. All block quotes are via Murphy. There are two ways to look at it. The first one is that the Sixers are not there yet, and that the smartest-looking people in the room are currently those who offered even the mildest of qualifications to their recent coronation. When the dust from the trade deadline settled, many assumed there would be another shoe to drop. If there is, it is still very much suspended. By the end of a 112-109 loss to a Celtics on Tuesday night, you couldn’t help but steal a glance up. The personnel is what it is. The Celtics knew it beforehand, and the Sixers knew it afterward. The 76'ers certainly look good on paper. Their Big-4 of Joel Embiid, Ben Simmons, Jimmy Butler and Tobias Harris is a potent quartet - on paper. Why has Philadelphia lost all three games to Boston this season, including last night's 112-109 defeat? And that really gets to the crux of the matter of these next couple of months, and the two different perspectives one can hold about this Sixers team. You can argue that this is one of the best two or three starting fives in the league. You can argue that it is one of the best two or three starting fives in franchise history. But you can’t argue the depth that has been sacrificed to bring it together, both directly via the players shipped out in trades for Jimmy Butler and Tobias Harris and indirectly via some of the teeth-grinding missteps along the way. The above tweet has nothing to do with my article, but just look at the very-dented, fully-inflated ball. Now onto Murphy's most important statement. It gives me a warm feeling to see him write "Boston's never-ending wave of tough, physical perimeter players wreaked havoc on their undersized defenders." "Tough" - "physical" - "wreaked havoc"? Are those our Celtics he is writing about? I guess so. I watched the game, and that is what I saw. And I loved it. Toronto, Boston, arguably Milwaukee – all have the sort of rotation depth and versatility to do things to the Sixers that the Sixers cannot do to them. I suppose we can soften that and say that the Sixers cannot do it right now. That much is obvious after a loss in which Boston’s never-ending wave of tough, physical perimeter players wreaked havoc on their undersized defenders. JJ Redick, T.J. McConnell, Furkan Korkmaz – good luck figuring out the mixing-and-matching that can be done. There’s no escaping that fact, nor its implications. The Sixers are not there yet. They just aren’t.